Originally from Berry, Jean-Serge Seiler began painting at a relatively late date. In search of a “new identity”, the process that led him towards artistic creation turned out to be an essential turning-point for him. Between 1990 and 2001, he was trained in oil techniques by Sauveur Cardonna at the Atelier de Clères, then by Pierre Godet at the Academy of Visual Arts in Bois-Guillaume, where he also studied pastels with Daniel Caplain. Since 2001, he has regularly participated in the Salon of Rouen, and attracted attention at numerous regional exhibitions. Throughout his career, Jean-Serge Seiler has been the perfect demonstration that an artist can get to the point, and do so by representing a synthetic world that sweeps us up into an innovative cosmic vision. If Jean-Serge Seiler can be described as a “landscape painter,” then his very unique work renews the theme in a multitude of variations, drawing the eye towards distant and profound horizons. This new world vision raises questions and cannot fail to leave the observer indifferent. It is entirely consistent with the history of landscape art as it developed in the West, and emerges as a sublime culmination of a theme that has captivated artists since Patinir, the famous 16th century Flemish artist who is reputed to have invented the “landscape genre” by painting it for himself. It also has the Romantic echo of John Constable, who was fascinated by nature, and of Caspar David Friedrich, the German who confronted mankind with a universe that escaped him. Yet with Jean-Serge Seiler, there is no human presence to be seen . . . . The landscape, that of our origins or genesis, remains empty because he invites us to enter it for ourselves. And so we participate in an internalisation of nature, one that is called to commune with the observer’s soul. Imaginary landscapes are conjured onto canvas with each new creation, as though hatching after a long period of being incubated in Jean-Serge Seiler’s inner world. Each piece becomes the culmination of a dream as it leaves the silent torpor inhabiting its creator. Although small or medium in scale, his compositions leave us with the strange impression of immensity. Sky, earth and water are conveyed with power and beauty in an unsettling style which, although always figurative, attains a high level of starkness, coherent with the artist’s deliberately simplified drawings, the intention being to exalt reality and to confer it with symbolic value. The dreamlike quality of the pictorial language, which is a constant in Jean-Serge Seiler’s work, is rendered in flowing brushstrokes and subtle monochromes of reds, ochres, blues or greys according to the theme of each of his series. 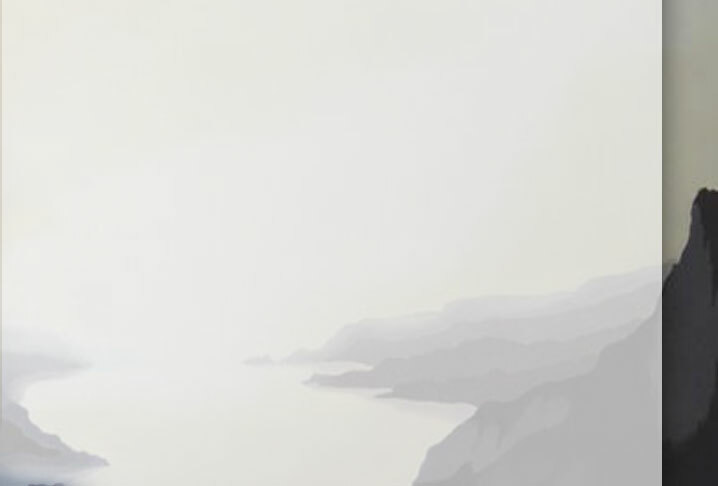 His work also reflects an ability to render atmospheric perspective through the gradual blurring of shapes, which fade into the mist. His use of white, the hueless colour banned since the end of the 19th century, becomes fundamental in creating lighting effects, in allowing the painting to “breathe”, and in giving a little freedom to the imagination. His works therefore give us the feeling of entering a pacified world, one that is both infinite and timeless. An insatiable explorer, Jean-Serge Seiler invites us to follow him not only on a demanding quest on a purely visual level, but also on a journey beyond time and space, elements that he conveys in his paintings through light, which for him becomes synonymous with eternity. His work is a veritable invitation to meditate on the human condition and its finitude, and the eloquent titles of his paintings or series reflect both his poetic dimension and the metaphysical reflection they suggest. This artist is rare through the profoundly silent and contemplative poetry that he transcends in the supreme quality of his artworks. Through his pictorial approach, Jean-Serge Seiler embodies the quintessence of harmony and meditative beauty. Using a palette of rhapsodic and fiery colours, the artist’s recent compositions convey a dreamlike and metaphorical world that evokes the beginnings of our presence on this earth. His use of space and the striking presence of white liberate landscapes, leaving room for existential questions, the imagination, and the mysticism of the eternal. In a veritable maiden voyage to the heart of human existence and the immaterial and original universe that inhabits it, the seven themes that are treated like metaphors by the artist come to light one by one, much like open books to the heart. Inside are inscribed the resonances of our inner lives and the phases that constitute them. In “Genèse” (“Genesis”), magma demonstrates decisive vitality, while in “Fusion” we discover a fiery explosion of intense colours, drawing the eye through the intensity and subtle blend of nuances. Little by little, in “Nulle part et l’infini” (“Nowhere and Infinity”) and “Le fini et l’immense” (“The Finite and the Immense”), matter comes into being in a more ‘solar’ palette, in which yellow tones outline an earthly landscape and where a physical presence is almost palpable. The infinitude of matter and shading gradually liberates a revealed entity, the full meaning of which becomes clear. Then after the agitation comes the self-evident “Galaxies”, in which violet prevails over a celestial whiteness that in turn liberates the mind and its emotional purity, gracefully transporting us towards “Aurores Bleus” (“Blue Auroras”) with its almost mystical monochromatic depths that welcome the dawn of a new day. Through the virtuosity of its symbolic message, “Entre deux rives, entre deux rêves” (“Between Two Shores, Between Two Dreams”) concludes this fantastical pictorial voyage, like an ode to the mysteries of the world and its divine beauty. If I had to define Jean-Serge Seiler in a few works, I would cite this reflection by Christian Bobin: “An angel digs over the sky with a spade, revealing a blue that attracts all the birds in my soul.” It is in this spirit that Jean-Serge Seiler’s figurative style allows us to hear the profound silence in his artwork. [...] What is striking in the work of Jean Serge Seiler, lies in the particular climate of his works and in the colours, apparently limited, which he uses. His painting is paradoxical because it does not cease to confront clear forms, easily identifiable, with a nebulous and fuzzy atmosphere, resembling landscape painting, but in a concept purified of any anecdotic connotation (one never sees a character nor "small bathers" in his paintings) his art unceasingly merge earth, sky and water. In his work, the contrasts between shadows and light stand out. As for white, which Michel Serres refers to as "the unspecified one", it offers, in the painter's own words, space for the imaginary to express itself freely, in particular, giving an insight into inner realities. Not pun intended, emptiness can also be plenitude, a concept which Oriental artists master with a rare understanding. If the work of Seiler, all subjects concerned, persistently seems to move away from the questions which agitate the world - we could call him the painter of silence - the fact is that he modestly seeks to offer a place of meditation to us, but this apparently peaceful space is frequently covered with temporary clouds or by vague storm threats. It is nature in all its force and beauty, a nature which, no matter what, always has the last word, a way to remind us that we are only a minor element. It is not surprising that the landscapes of the bay of the river Somme or the roughness of our cliffs fascinate this man of reflection and questioning. "I paint so I can exist a little longer" as the wonderful expression goes "being there is nothing". The element air is omnipresent in J.S. Seiler's work, asserting as well a "certain emotional fragility", essential according to us, to any authentic approach. "Confrontation with the gaze of our fellowmen is the most constructive element, Seiler acknowledges. Work in itself is always an ordeal, a gamble. The pleasure is given to us only through the final result and the enthusiastic recognition coming from the other." Between darkness and light, Seiler, as an honest man, journeys through what one could call "the heart of the world", a concept which is nothing else but the reflection of the micro-universe that we carry within us. This is the representation of the most touching and universal side of his painting. Even after more than 30 years of artistic reviews and observation, I never cease to be amazed by a discovery, a unique artist, or an original way of treating a work of art with as much respect as skill. This is the case for the painter Jean Serge SEILER, who has lived in Normandy for over half a century and who has proven to be a discrete and talented artist. I noticed him some years ago in a regional salon in the country, and remained dumbstruck before the quality of his brush-stroke, his analytical sense of movement and the poetic elegance of his palette of well-chosen colours. Well, Jean Serge SEILER keeps his promises and his recent creations are still captivating with their same charm and same harmony. Clearly, this artist has not succumbed to the desire to paint just anything, anyhow, to satisfy a legitimate creative wish, but has channelled his energy into the difficult areas of drawing and composition before successfully exploring his artistic conscience with flare. To examine his conception of landscapes, which are remarkable in their composition on successive planes, is to admire the halo of mists that have a captivating and luminous quality. As for his floral creations, they associate sobriety of colours with the emotion inspired by large petals, rendering them fascinating and mysterious.